Gout is a form of arthritis that occurs when there is an accumulation of uric acid in the blood which leads to inflammation in the joints. Gout can affect different body parts such as the ear as well as small joints on the wrist, ankles, hands, and knees. Acute gout is a painful form of gout that affects only one joint. Chronic gout, on the other hand, leads to repeated bouts of pain and inflammation and often affects multiple joints. the body produces too much uric acid. the body finds it difficult to get rid of the uric acid. Factors that can increase the likelihood of having gout include; too much stress, excessive consumption of protein, excessive consumption of alcohol, genetics, and lack of physical exercise. Gout may also develop in people with; obesity, kidney disease, diabetes, leukemia, and sickle cell anemia. Common symptoms of gout include; inflammation in joints, severe pain, tenderness, and swelling. Reduce your consumption of alcohol especially beer. If you are overweight or obese, lose the excess weight. Include exercise in your daily routine. Cut down on your consumption of sugary beverages and red meat. Opt for healthy foods, such as nuts, legumes, whole grains, and fruits (the less sugary ones), in your diet. 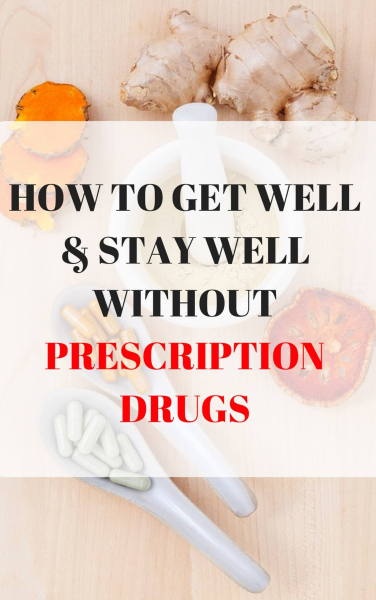 You could also opt for vitamin C supplements as it may help some people. Consult your doctor before taking any supplement. Cayenne pepper is an old favorite that can be used to treat g out. Mix 1 tablespoon of cayenne pepper with wintergreen oil of about 2 tablespoons until there is paste formation. Then, gently massage on the affected joint. Note: Keep your hands away from your eyes and then wash your hands thoroughly after applying this remedy. Grapes are high in alkaline and are great for reducing the acidity of uric acid. They also help to expel uric acid from your body. You should keep in mind that uric acid crystals are among the causes of gout manifestation. Consume at least a handful of grapes a day. Grape seed extracts are also effective for gout pain relief. Cherries have been shown to relieve gout pains and symptoms because of the natural anti-inflammatory properties they possess. Cherries also have anthocyanins which help curb inflammation and gout attacks. While cherry juice has proven to be the most effective, the consumption of dried or fresh cherries also has beneficial effects. You could opt for 10-20 cherries a day or simply take a glass of cherry juice daily. Blueberry contains flavonoids and anti-inflammatory anthocyanins that are effective when it comes to treating gout. This is a home remedy that can be consumed any time of the day. Alternating cold and hot compresses help to reduce the gout pain and also helps to dissolve uric acid crystals by increasing blood flow. For this remedy, alternate 3 minutes of hot compress and then cold compress for 30 seconds. Repeat for 20 minutes. When processed into a juice or tea, nettles and yarrow can be effective when it comes to dissolving uric acid crystals and removing them from your system. For this remedy, add equal amounts of each in boiling water for about 10-15 minutes. Strain them and drink between 2 to 5 cups in one single day. Another simple home remedy for gout pain is to drink a lot of water daily. You’ve probably heard of the numerous benefits of drinking eight glasses of water every day. 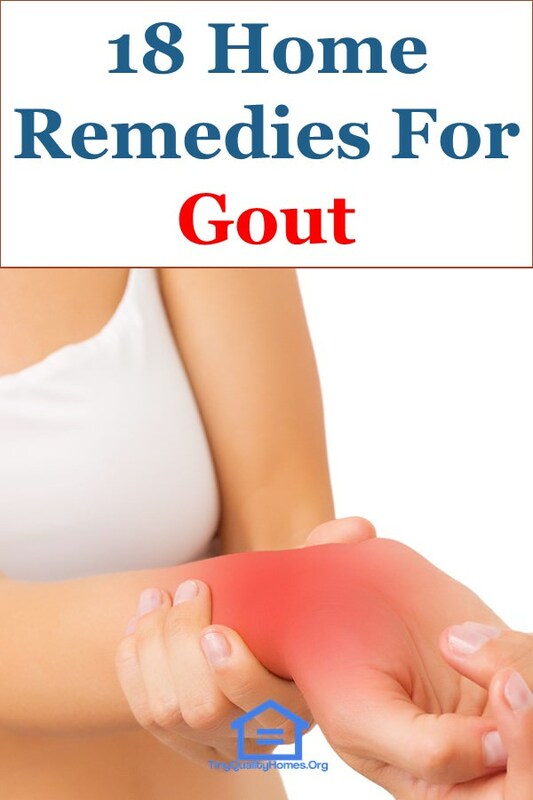 The reason why this remedy is so beneficial, for gout, is that by drinking a lot of water, you would help flush out the excess uric acid in your system. It is this uric acid that leads to the discomfiting pains and mobility problems associated with gout. Drink between 2 and 3 liters of water, especially natural mineral water, each day. Exercise and weight control have been associated with the treatment of gout, as they often lead to better wellbeing and Body Mass Index (BMI). As such, the kidneys do not have to work so hard to flush uric acid out of their system. The two most popular exercise routines for those who suffer from gout symptoms are yoga and water aerobics. As with all forms of arthritis, these two forms of exercise are easier on the joints than others. Ice is also one of the ways to relieve gout. Applying an ice bag to the affected area can help numb the pain. It’s important not to let the ice pack stay for more than ten minutes at a time. You do not want to cause frostbite in your attempt to relieve the gout pain. Use this remedy as often as necessary. For this remedy, apply an ice pack directly to the painful swollen joints for about 5-10 minutes. Note that the feeling of ice may initially worsen the pain, but after a few minutes, you would feel relief from the gout pain. If drinking plain water just does not seem appealing to you, you should concoct an herbal tea. By consuming herbal teas, you get the recommended amount of water every day and you also benefit from the herbs. Some of these herbs, such as peppermint and rosehip, are especially helpful when it comes to treating gout. Adding a small orange or lemon zest to your tea can also be considered among the simple home remedies for gout. Citrus fruits can really help relieve the burden of pain. A herbal tea can also be prepared by placing a tablespoon of chickweed in a cup of boiling water. Once the herb has set, strain it and drink a quarter of the preparation four times a day. This would help with pain relief. Banana is an effective home remedy for gout as the high potassium nature of banana would help convert the uric acid crystals to liquid making it easier to be flushed from the body. Bananas also contain a fair amount of vitamin C which would help alleviate swelling and pain. Take 1-2 bananas daily and you would soon start noticing the result. You could also take banana and yogurt to help minimize the likelihood of diarrhea. Raw carrot juices can also be used to treat gout. Carrot juice, mixed with the cucumber, is effective when treating gout. Lime is another effective treatment for gout. Lime has citric acid that helps dissolve uric acid an agent of gout disease. For this remedy, squeeze half a slice of lime in water and drink. Do this twice a day. A charcoal bath is a good home remedy for gout. For this home remedy, mix water and half a cup of charcoal powder in a basin until there is a paste formation. Place the affected foot in the basin/pool. Then slowly add water up to the point when the foot is totally immersed. Leave your foot in the charcoal bath for about thirty to sixty minutes. ACV is an effective home remedy for gout relief. Mix 2 tablespoons of apple cider vinegar with 2 tablespoons of honey. Go for organic apple cider vinegar or honey if you can find it in the store. Apply the mixture several times daily to the affected area. Soak your feet in Epsom salt solution when the pain is concentrated in the big toe. Epsom salt contains magnesium, which helps to remove toxins and wastes from the body. This is one of the best home remedies for gout. For this remedy, take the mustard powder and wheat powder in equal quantities and make a paste by mixing with water. Then, apply this paste to the affected area and leave it there overnight to achieve effective pain relief. Ginger has potent antioxidative and anti-inflammatory constituents, such as gingerols and shogaol, that help alleviate inflammation and swelling caused by gout. Those who suffer from gout can insert their feet, for thirty minutes, in a mixture of water and ginger. This would soothe you and as a result help in reducing gout pain. You could also make ginger tea and drink twice a day. Furthermore, you could add ginger to your meals.